Going shopping for food is difficult if you are trying to live on a budget. Sometimes it is as though the price of food goes up on a daily basis and you are constantly trying to feed your family from a budget which seems to give less each week. This is why it is important to organize your weekly shop in a way that can help keep you within budget. While this is not impossible, it can become easier. The first step is to ensure you have worked out the amount of money that you have to spend. This is sometimes difficult if you haven’t put the time in to work out exactly how much you need to pay your bills. Creating a working budget is not about being restrictive with your money but to give you the freedom to know what money you have available and what you need to pay your bills. It is important if you are looking to reduce the cost of your food bill, you plan and make the most of the available money. Bad shopping habits die hard. It is also important to tie in your shopping into your meal planners. There is no point planning to cook a particular meal if you haven’t got the ingredients and you can’t afford to purchase them. Plan the meals that you intend to cook and work out the ingredients that you need and can afford. 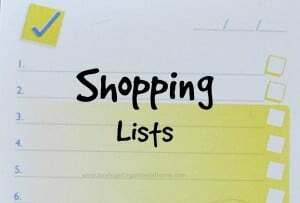 It is a great idea to create a list of the items you need and to use this when you go shopping. If you dislike using a note pad and pen then it is possible to get an app for your phone where you can record information of the items that you want, on the app. It reduces the need to carry a pad around with you and it will mean that it is easier for you to add items to your shopping list, the disadvantage is when the rest of your family want to add items to a shopping list they won’t have access. It is important that you add up the value of items as you put them in the trolley. This is the only way you will know whether you have enough money for the items you need with the budget you have. It is fine that some weeks it is easier to get all the items than others. This is because sometimes there are more basic items required, this makes the money you need for basic items to fluctuate over the weeks. If you take this fluctuation into account, it will allow you to balance the items you need and spread out the differences over the course of the month. Therefore, if you plan your shopping list carefully and you know your budget, then you are in a better place to do your grocery shopping each week within budget. Organization of your weekly shop comes from being prepared. If you have the basic information written down, then compiling your meal plans and your budget is a simple process. Having the list for the shop, you are visiting in sections so you are aware of the most important items, down through to the items that are treats, then it becomes easier to work out and shopping is a less stressful and more organized affair.